It’s late 2009 and IT professional and photography fanatic Pierre Axiaq is tinkering with his latest project – a 360 degree panoramic photo. Confiding in his friend and fellow IT professional George Borg, the two history buffs set about perfecting the images and the process behind them and to putting the idea to good use. They decide to place the images online for all to see, and also so as to dispel the widely held myth that there is nothing much to see in Malta that can’t be visited and done in a day or two’s sightseeing. So began maltain360.com. 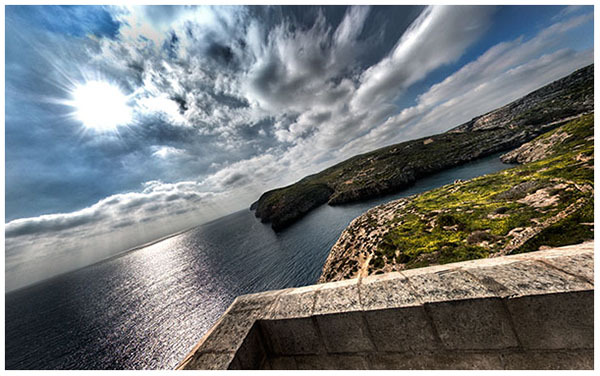 Today, the site features over two hundred 360 degree panoramic images of historical, scenic or otherwise interesting locations from across the Maltese archipelago. Maltain360 has proved immensely popular and its success has been recognised more officially too with the site having scooped the Most Promising Innovation Award in the Malta Innovation Awards 2012. Among the most popular of the 360 images on the maltain360 site are those of the Cottonera Lines, Għar il-Kbir, Lascaris War Rooms, the War Hospital Shelters under the Police Headquarters, the Medieval Chapel at Ħal-Millieri. However, in this article, Pierre and George are sharing a few of their particular favourites. Situated on Manoel Island in Marsamxett harbour, construction on Fort Manoel started in 1723 after it was rightly pointed out that the almost brand new city of Valletta could suffer heavy damage from an undefended island flanking it. The fort was intended to act as an outpost for Valletta while covering the city’s western flank. Fort Manoel is one of Pierre’s favourite 360 degree images as the seaward entrance shows the awe inspiring western side of Valletta to great advantage. The fort was also military engineer François de Mondion’s magnum opus and he had expressed his desire to be buried in the Chapel of St Anthony of Padua located in this same fort. He died of a heart attack on Christmas Day 1733, however his tombstone was sadly lost through the ages. The 360 degree image of the Summer Solstice at Mnajdra Temples is one of George’s favourite images for the simple reason that so very few people ever have the opportunity to enjoy the momentous twice yearly occasion. The solstice at Mnajdra demonstrates the advantage of having such happenings digitized and available all year round on a website for all to see and this thought motivates always George. While it is it is not known for certain whether the Mnajdra temple’s orientations with the solstices and equinox were intentional, they are so precise that it is very probable, also as in prehistoric agricultural societies the observation of the motion of the stars, the moon and sun could have been related to the changing seasons and times of planting and harvesting crops. The Mġarr ix-Xini bay in Ta’ Sannat, Gozo can be found on the island’s south-west shoreline. The Mġarr ix-Xini Tower is the largest of the handful of coastal watch-towers erected by the Knights of St John on the island of Gozo which it is to be noted was much less fortified than Malta. Built in 1661, one year after Grandmaster De Redin’s death, the tower has no inscriptions as to who erected it, however, similarities in its design to other towers in Malta, as well as the fact that it was De Redin who built a network of 13 towers on the larger network all point towards the same Grand Master as the hand behind the Mġarr Ix-Xini Tower. The Mġarr ix-Xini Tower was jointly restored during the year 2000 by the Ministry for Gozo and Wirt Għawdex. It is one of Pierre and George’s favourite images not just because of how heavily set in stone the tower is, but also because of the supremely panoramic vantage point it enjoys, as demonstrated by the picture below, snapped from the 360 degree panorama from the tower’s roof. George and Pierre are out there constantly collecting more 360 degree images of these fascinating Islands. Check back on their site for more panoramas and stay updated with the latest news from Maltain360 on their Facebook page. Previous Post Burlesque is back in Valletta!